Indian fig opuntia (Opuntia ficus-indica): growing, planting, caring. A cactus with an edible fruit! Opuntia ficus-indica is a species of cactus native to Mexico. Opuntia ficus-indica is perennial shrub that grows up to 3-5m height, with thick, succulent and oblong to spatulate stems called cladodes. It has a water-repellent and sun-reflecting waxy epidermis. Cladodes that are 1–2 years old produce flowers in three distinct colours: white, yellow, and red. 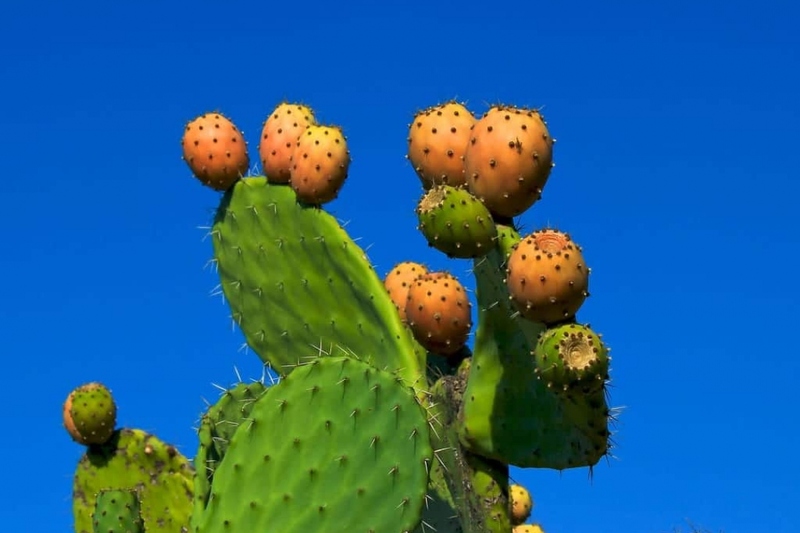 The opuntia is easy to recognize, its branches have a spiny racket shape, and it bears colorful fruit in summer. A Mexican desert plant, loving hot and dry atmospheres, the opuntia is well acclimatized in the Mediterranean region. It is frosty at -5 ° C, so in a harsh climate you will have to protect it during winter, or plant a more resistant species of Opuntia. In open ground, plant in full sun, in drained soil. In pots, favor a large container, and fill it with garden soil, sand and compost fiber equally. Watering in the ground is not necessary. In pots, let the substrate dry between waterings, then do it abundantly. Be careful, if your opuntia is planted in peat, it may not be re-moistened at all, it is better to prefer sand for drainage. In winter, water rarely, to spend one or two waterings a week in the summer. The first years, as long as your plant is handlable, repot each year in a mixture of sand, earth and fibrous compost. Then, if you can not easily repot your opuntia, replace the topsoil with fibrous compost. In spring or summer, take a cladode - a flattened stem that resembles and functions as a leaf but is actually ... a stem! - wait a few days then plant it in a mixture of soil, sand and fibrous compost. How do you harvest the fruits? With caution ! In the summer, harvest the fruit with a knife, taking care of the thorns. Then simply cut in half and empty them with a spoon. You can, if you have room - and it is not too big! - take out your opuntia in pot for sunny days. If you fear frost, bring your opuntia in pot inside for the winter.